One of my first jobs cooking was in the kitchen at a local country club. The chef quit and they needed someone to sling breakfast for the golfers. Not one to shy away from a challenge, I jumped in. It was quite the experience that taught me many things but I also realized how much I love cooking on a griddle, especially with pancakes. So, when my new oven came with a griddle top, I knew pancakes were going to become more prominent in my breakfast repertoire. While my base for the pancakes doesn’t change much, the toppings are constantly new. 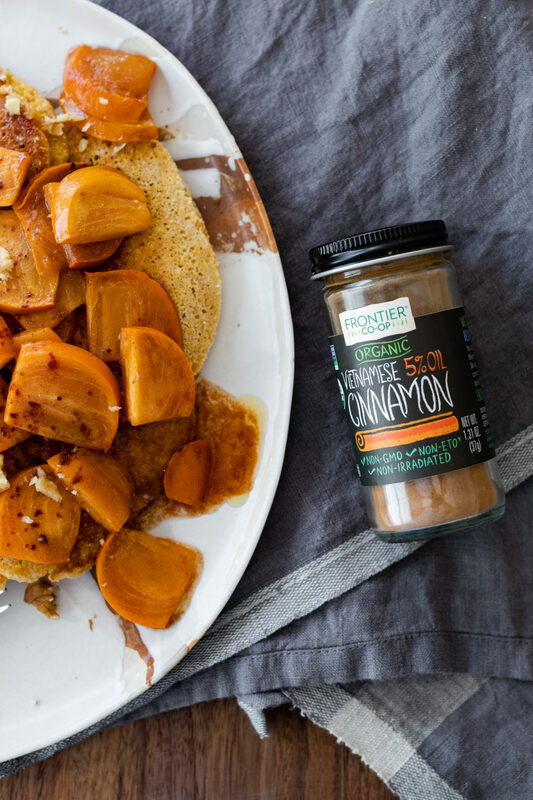 These whole wheat pancakes showcase one of my fall favorites: persimmons with a bit of cinnamon. I’ve chatted a bit about different varieties of whole wheat flour before but I always feel like it’s worth revisiting. My go-to wheat flour for pancakes is almost always whole wheat pastry flour. Using pastry flour keeps the texture of the pancake lighter than a more traditional hard wheat flour would be. In addition to pastry flour, I’ve also found I love using Einkorn flour as a 1:1 substitute for the pastry flour. Einkorn is such a warm, light flour. Of course, you can always swap in all purpose or your favorite gluten-free mix! Frontier Co-op has a few different varieties of cinnamon that range from the slightly sweet, like this Vietnamese cinnamon to Korintje cinnamon, which is a bit on the spicier side. Each cinnamon has root in different cuisines and I’ve started to use different varieties for different uses. A far cry from the three year-old cinnamon I’d often find pushed back in my cupboard. I realize I’m pushing towards the end of persimmon season since we’re officially in hoshigaki time. However, if you can land your hands on fresh, persimmons make for such a lovely pancake topping. Of course, you can always swap them out for another firm, cooler-weather fruit such as apples or pears. Finally, the walnuts are optional but I’m a texture person who almost always needs a little crunch. Toasted pecans would work well as a substitution or go with sunflower seeds for a non-nut crunch. Combine pastry flour with the baking powder and salt. Add the milk, egg, melted butter, and maple syrup. Give a good stir, until everything is just combined but there might few small lumps left. Let rest while heating the griddle or pan. Heat a skillet or griddle over low to medium-low heat and grease with butter or oil if need be. When skillet is hot (if you flick water onto the skillet, it should sizzle), take a scant ¼ cup of batter and pour onto skillet. Let cook for 1-2 minutes (until the pancakes begins to bubble slightly. Flip and let cook for another 1-2 minutes until pancake is cooked through. To make the topping, cut or cube the persimmon into slices or pieces. Melt the butter in a pan and add the persimmons along with the maple syrup, cinnamon, and salt. Cook, stirring occasionally, until the persimmons are starting to soften but still have a bit of firmness. 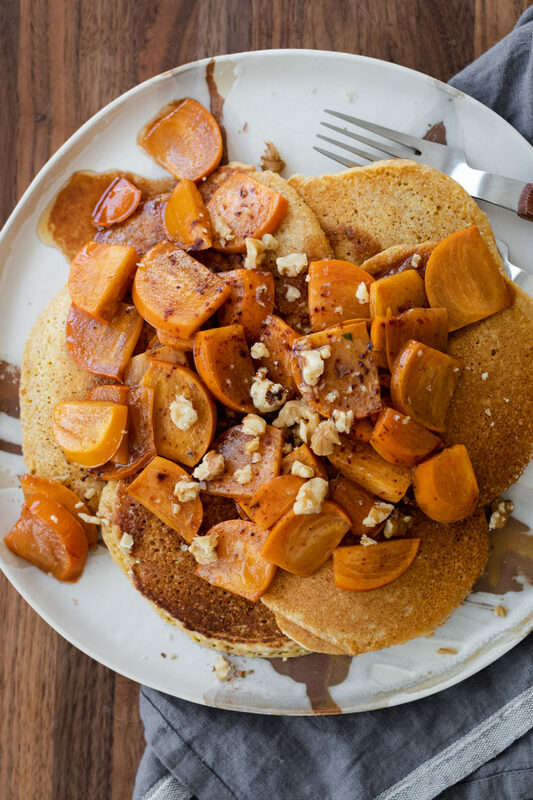 To finish the pancakes, top with the persimmons, a sprinkle of the toasted walnuts, and a sprinkle of cinnamon.